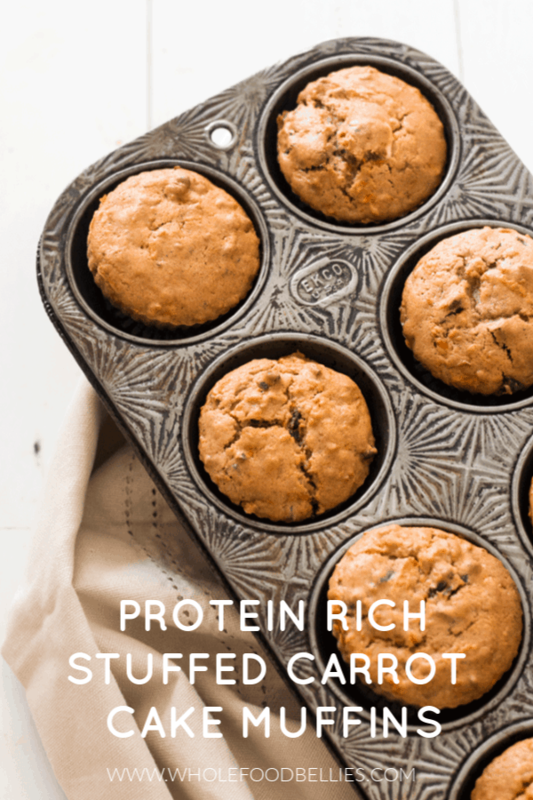 Protein-rich carrot cake muffins stuffed with cream cheese are a great way to sneak some veggies into your afternoon snack. Kids love them, they are nut free and they freeze well so perfect for meal prepping ahead of a busy week. I have a fun little muffin recipe to share with you today: easy carrot cake muffins stuffed with a gooey dollop of rich cream cheese. Sound delicious? Let me tell you they have been going down a treat around here. 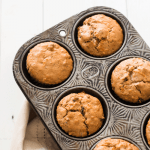 What Ingredients Are Needed For Carrot Cake Muffins? These little cream cheese stuffed carrot cake muffins have been such a hit with kids and adults alike. I had my kids help to make a batch, so they knew there was a lot of carrot in there and they didn’t mind one bit. In fact, once baked, they couldn’t believe the carrot was still in there! They are super moist and full of flavor, and that little pop of cream cheese in the middle is such a fun surprise. How Much Cream Cheese Should I Stuff In the Middle? Now this is where you might have some arguments. We had differing opinions around here: the girls liked a little bit (maybe half a tsp) but the boys and the baby liked a lot (1 tsp++). Solution: Make two batches or just do half the batch with a big chunk and the other with a small one. Just remember which one is which! I love using silicone cups when making muffins as they are easier to remove from the tray. I found these cute pastel cups with no BPA and have been loving them. What Else Should I Know About Carrot Cake Muffins? they have a nice kick of protein from using Greek yogurt. I have also used applesauce and mashed banana with great success if you want some fruit in there. Hot Tip: If you are into juicing these would be a great way to use up the pulp from your juice. Just use 1 cup of juice pulp in place of the grated carrot and you are good to go! Fill each cup in the pan to about 1/2 full. Add about a tsp of cream cheese (depending on your preference), add another dollop of muffin batter so the cup is about 3/4 full. Bake for about 15-17 minutes, or until a toothpick inserted into the center of a muffin comes out clean. 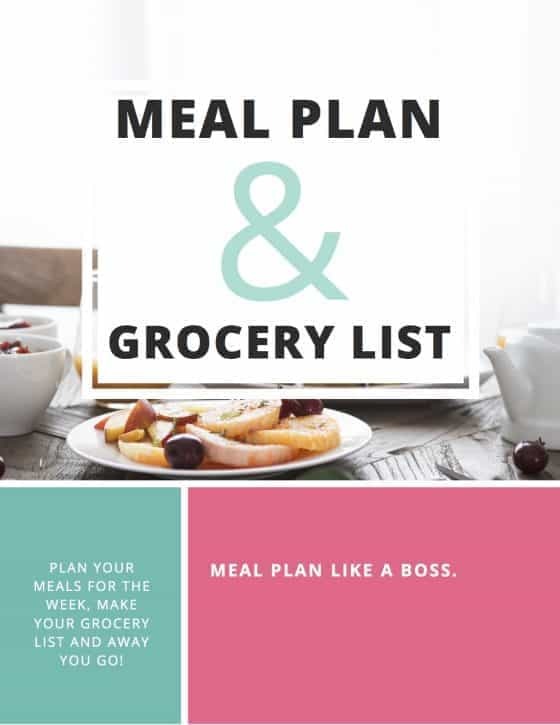 You can sub in applesauce or mashed banana for the Greek yogurt if that is what you have on hand or you want some extra fruit in there. Carrot Apple and Ginger Mini Muffins. Definitely! I made the mistake of packing a muffin with cream cheese on top once before…never again!